Introducing the Universal Secure KVM. Visit the Secure KVM category page. The threat of cyber-attacks is at an all-time high. Cyber criminals have become more sophisticated, and significantly better funded to pursue their ultimate target – your network assets. See how our secure KVM switching solutions protect you and your valuable network assets from harmful behavior. Secure KVMs allow users to share a single keyboard, mouse, and video displays across multiple systems. This NIAP (National Information Assurance Partnership) certified peripheral sharing capability maintains air-gap isolation between computing devices and protects networks where they are most vulnerable, the desktop. 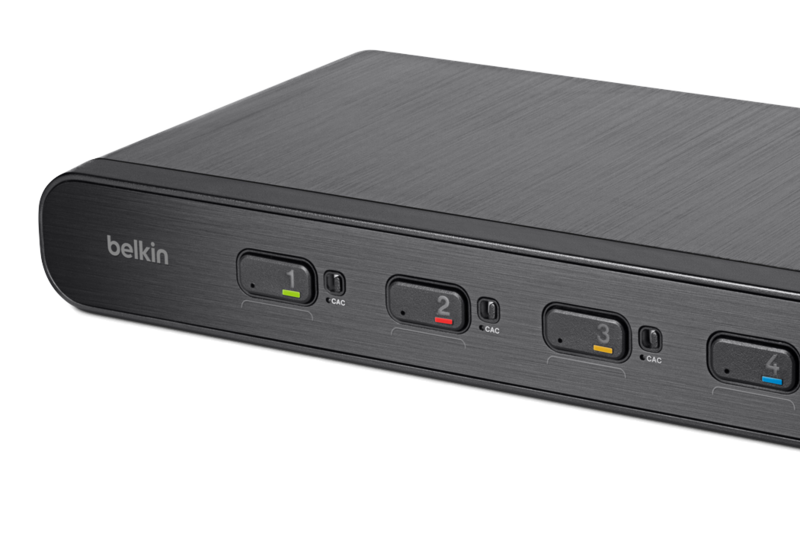 Belkin is one of the most respected and successful computer connectivity suppliers in the world. Our secure KVM switch solutions safeguard critical network assets by maintaining network isolation while improving an operator’s efficiency and effectiveness in working across secure and non-secure systems at their desktop. For news & updates, follow our Belkin Cybersecurity LinkedIn Page. Looking for a standard desktop or console KVM? Visit the KVM category page.